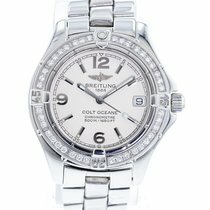 Breitling Colt Ocean Lady quartz watch with diamonds on bezel. Steel with steel bracelet. - Fully checked by our certified Breitling watchmaker.